A very small percentage of people in today’s society are willing to invest in good quality appliances. Most people opt to go for quantity instead of quality. Such that they can buy a backstreet refrigerator worth Kshs. 10,000 instead of an original one for Kshs. 25,000. The electrical appliance in turn starts causing problems a few days after. Problems like production of poisonous fumes hence contaminating the food, damaging the electrical system in your home and eventually breaking down. 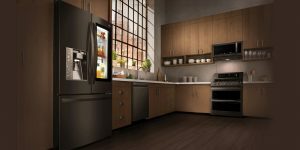 The kitchen is one of the most important places in one’s house and it is paramount that the appliances that you install in your kitchen are the ones that bring your kitchen to life. The organisation, the design and the colour scheme. An advantage of the LG kitchen appliances is that they are intuitive to the day-to-day needs of the consumer. For the particular users, the LG products come in a cool toned colour scheme. Grey and white being the most common followed by black and brown. Have you ever imagined having a kitchen where the appliances are one colour? The ambiance? How beautiful can that setting be? The diverse range of kitchen appliances LG provides offer ergonomic alongside smart functionality. “Shopping for any new kitchen appliance is an important decision – but it doesn’t need to be a chore. LG kitchen appliances are consistently rank highest in performance, quality, reliability and customer satisfaction by leading experts – but do not just take our word for it. We invite consumers to check the facts for themselves and shop with confidence, knowing that LG laundry appliances deliver superior performance and reliability,” said LG Electronics East Africa Marketing Manager, Mr. Moses Marji. LG appliances come inbuilt with a network of artificial intelligence capabilities that offer efficient services for a long time. Fortunately, LG offer a warranty to the customers once they purchase a product. This is a guarantee that in case anything happens in say a span of one year of purchase of the appliances they will take that responsibility and either fix the issue or replace it for you. In Kenya, the authorised service centre is located at Highwayy Mall, Lower Ground Floor, Uhuru Highway, Next to Nakumatt MEGA, Nairobi.